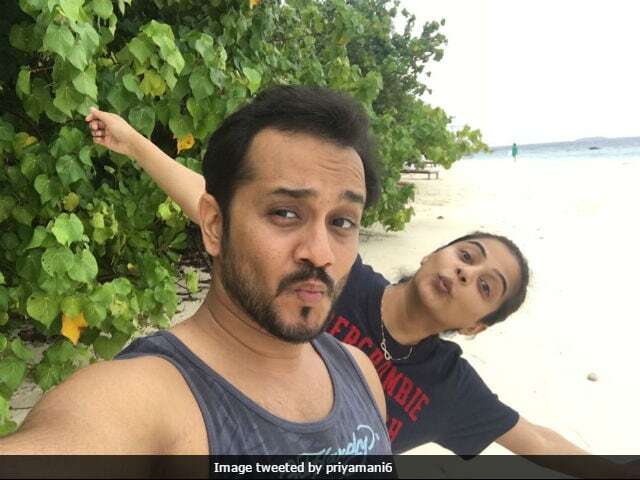 Priyamani got engaged to Mustafa on May 27 last year in a private ceremony which was held at her Bengaluru residence. She shared the news with her fans and followers on Twitter along with a beautiful photograph. In an earlier interview with Deccan Herald, the 33-year-old actress said that she 'always wanted a simple wedding.' "We have always wanted a simple wedding and that's exactly what we are going to do. The reception will be a grand one," Priyamani told Deccan Herald. Priyamani will be seen wearing an outfit designed by Poornima Indrajith at her wedding reception. Priyamani has featured in several Kannada, Malayalam, Tamil, Telugu and Hindi films. She made her acting debut in 2002 with Telugu film Evare Atagaadu. Priyamani gained recognition for her performance in Tamil film Paruthiveeran. The movie won her the National Film Award for Best Actress. Priyamani made her Bollywood film debut in 2010 with Mani Ratnam's Raavan, starring Abhishek Bachchan and Aishwarya Rai Bachchan. She later portrayed a small role in Rakta Charitra II and featured in the song 1 2 3 4 Get On The Dance Floor from Shah Rukh Khan and Deepika Padukone's Chennai Express. Priyamani was last seen in Tamil film Chowka.